Looking for a sweet treat that won’t make you feel guilty? 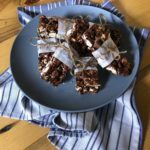 In Episode 8 of our Make It with Hamilton Beach series, host Miranda Malisani shows us how to create crunchy and delicious popcorn chocolate bars using the Hot Air Popcorn Popper. Using sunflower seed or pumpkin seed butter also makes them school safe! Fill popcorn kernels to the line in the hot air popcorn popper. Once popped measure out 6 cups. Using a double boiler method, combine chocolate chips, pumpkin seed butter and sea salt while stirring until melted. Cover popcorn with melted chocolate mixture and stir so it's evenly distributed. Place an unbleached sheet of parchment paper in an 8x8 pan. Add chocolate popcorn mixture to the pan and press down to make even. Place pan in fridge to cool for 1 hour. Once cool, cut into desired squares and enjoy! If you want to do something memorable for your sweetheart this Valentine’s Day, but want to avoid the crowds and overpriced menus, consider making a romantic dinner for two at home with a special chocolate dessert. Fondue is a fun, whimsical dessert that is perfect for an intimate dinner because it can be prepared in advance and kept warm while you eat. If you don’t have a fancy fondue set, you can still enjoy this decadent dessert using a small slow cooker. Dip your fruit or pound cake right into the slow cooker or scoop the chocolate mixture into a bowl and surround it with assorted dippers like strawberries, pineapple, banana, angel food or pound cake, pretzels, marshmallows or cookies. Don’t forget to share! 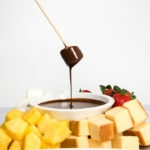 Fondue is the perfect dessert for trading sweet bites with your Valentine. We recommend using a 3- to 4-quart slow cooker. My game plan going into the holiday season always includes two things. 1. Do as much shopping as I can online. And 2. Make homemade gifts. Clicking a button takes a little bit (OK, a lot) of the fun out of gift-giving and holiday shopping. I fill that void by setting aside time to make some of my gifts. Whether it be having a craft night to make homemade gift bags or spending the day in the kitchen making edible presents (the best kind of presents). 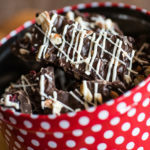 This cranberry almond salted chocolate bark is an easy recipe to whip up and hand out to neighbors, coworkers, or friends. I topped my bark with dried cranberries and almonds, but pistachios would be a nice addition (keep the red and green theme going), or keep it nut-free and add other dried fruits like apricots, or even candied ginger. Bag the bark in cellophane gift bags and tie with festive ribbon and holly or pack it into holiday tins that the lucky recipient can reuse at their next cookie exchange. Give a gift made with love this holiday season. 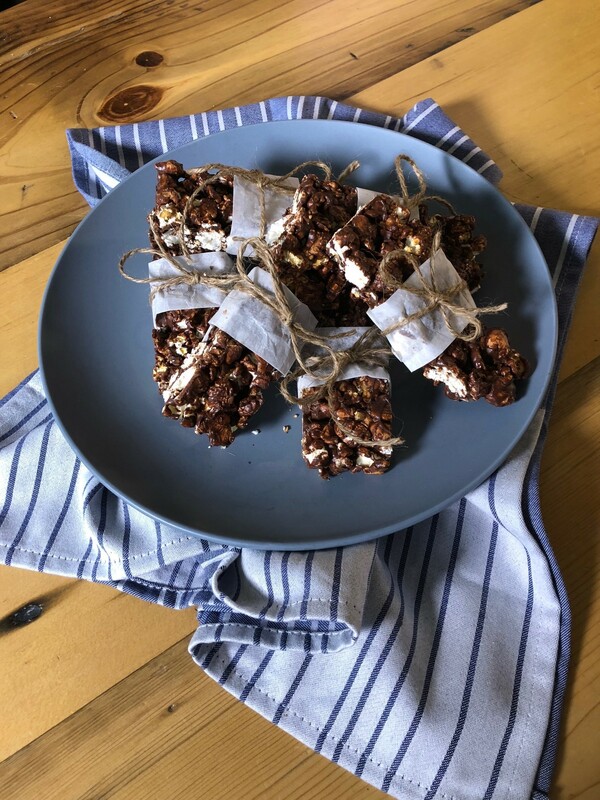 Find the recipe for our holiday bark below and head to the kitchen. In a large microwave-safe bowl on 50% power, stirring occasionally, microwave dark chocolate wafers and almond extract 2 to 3 minutes or until smooth. Add cranberries and almonds to chocolate, stir until blended. Immediately spread mixture evenly onto lined cookie sheet. Let stand until chocolate is almost set. Sprinkle with sea salt. Let stand until completely set. In a small microwaveable bowl on 50% power, stirring occasionally, microwave white chocolate chips 1 to 1 ½ minutes or until melted. Drizzle over chocolate mixture. Let stand until drizzle is set. Break into pieces. Store in an airtight container in refrigerator. If you’re on Pinterest in September or October, it’s likely you’ll come across a few hundred Halloween recipes. 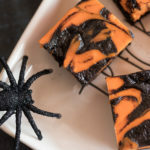 While there are a variety of creepy, crawly treats to make for your kids or Halloween party guests, you can’t go wrong with a festive Halloween brownie. Add these black and orange cheesecake brownies to your spread along with other Halloween party recipes like graveyard dip and jack-o-lantern stuffed peppers. Cheesecake brownies are the best of both worlds. The sinfully rich chocolate brownie (dyed black, of course) on the bottom will satisfy any chocolate-lover’s sweet tooth this Halloween. The silky cheesecake top layer (dyed bright orange with food coloring) completes this Halloween dessert. It’s far better than any candy bar the kid’s bring home from trick-or-treating, trust us. Make sure your Halloween party is heavy on the treats and not the tricks this Halloween and make homemade cheesecake brownies for the hungry ghouls and goblins at your house. Heat oven to 325°F. Line a 9-inch baking pan with aluminum foil. Spray with nonstick cooking spray. Set aside. In a large bowl with an electric mixer on medium-high, beat butter and granulated sugar until blended, about 2 minutes. Beat in eggs, milk and vanilla until blended, about 1 minute. Gradually add flour, cocoa, salt and baking powder until blended, about 1 minute. Reserve 3/4 cup batter. Spread remaining batter into prepared baking pan. Meanwhile, using a hand or stand mixer with wire beaters on MEDIUM speed, beat cream cheese, granulated sugar, brown sugar and orange icing color until blended, about 2 minutes. Beat in sour cream and add 1 egg at a time until all eggs are mixed in and mixture is fluffy. Gently spread cream cheese mixture over brownie. Drop reserved brownie batter by spoonful onto cream cheese mixture. Using a knife, drag the tip of the knife through each drop of brownie to create a swirled design. Bake 40 to 45 minutes or until cheesecake is set. 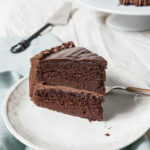 If you thought you were a fan of chocolate cake before, wait until you try this triple chocolate cake. After all, three layers of chocolate are definitely better than one. There’s no doubt about it. Start with two layers of freshly baked chocolate cake. Then make homemade chocolate frosting. Pipe the frosting on top of the bottom layer, then top with the remaining cake layer. Instead of topping the cake with the remaining frosting, make a simple ganache in your microwave. Add chocolate chips, heavy cream, and butter to a microwaveable bowl and microwave until the butter is melted. Remove from the microwave and stir until the mixture is smooth, shiny, and pourable. How easy is that? Top the cake with this delicious ganache and spread to the edges. Then pipe the remaining frosting around the cake. Want an ultra-rich chocolate cake? Our Test Kitchen adds a little bit of coffee to the cake batter. Coffee doesn’t leave you with a coffee or mocha flavored cake, but rather enhances the chocolate flavor. If you’ve never tried adding it before, it’ll be love at first bite. Serve this decadent cake at celebrations throughout the year – with champagne and strawberries on Valentine’s Day, on Father’s Day to those dads with a sweet tooth, or for any chocolate-lover’s birthday. No matter the occasion, there’s always a reason to bake with a little love and a lot of chocolate.